Home » Email vendor Selection Articles » Email deliverability checklist: Sending email is not the same as delivering. In this Email deliverability checklist we will see that the actual sending of email is one tiny step in a larger process of delivering email. There are a myriad of other requirements that need to be covered by yourself and your ESP to get emails into the inbox and for the emails to then be engaging enough for your customers to read them. Deliverability is a complex environment that requires all the moving parts between technology, professional services, industry knowledge and processes to work together. There is no silver bullet and all the settings in this Email deliverability checklist need to work in conjunction with each other to have the desired result. How does your ESP measure up when it comes to maximizing deliverability? 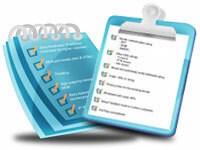 Use this checklist as a guideline to judge their deliverability rate. An ESP’s MTA (mail server) may not be able to support some essential features that are required for enhancing deliverability. Make sure they have all the features in this Email deliverability checklist and are able to provide these in their standard offering. When your email sends reach a certain volume, in order to have full control over your deliverability you want a dedicated IP address. This is a single point that only your emails are sent from. You have full control over your reputation and subsequently your deliverability. Some ISPs bounce emails if they receive too many messages from one sending address at a time. Throttle the number of messages per hour to meet ISP restrictions. ISPs authenticate incoming messages to verify the sender. If you are unable to authenticate yourself, you may be seen as a spammer. DKIM is an anti-spam method that uses a combination of public and private keys to authenticate the sender’s domain and reduce the chance that a spammer or hacker will fake the domain sending address. This technology helps fight phishing. Retry feature for temporary failures/greylisting. A mail server using greylisting will “temporarily reject” any email from a sender it does not recognize. If the mail is legitimate the originating server will, after a delay, try again and, if sufficient time has elapsed, the email will be accepted. An IP address with no sending history is in danger of having the emails blocked. Employ IP warming techniques so that you can build up a reputation with recipient mail servers before you start sending them large batches of emails. It is important to confirm your identity as a sender. Email providers should check your domain or IP against databases of trusted senders. This also helps prevent phishing and spoofing of emails. Although your email service provider may be the one directly responsible for the setup of these items, it is important that your mail administrators work with the ESP, as they will guide them through the process and give the correct settings. SPF – This is a way to say an IP or domain can send email on your behalf. It prevents ‘from’ address spoofing. DKIM – A means to digitally sign an email message and associate a domain name with it. This signature gives recipients and ISPs a reason to believe the email message was created by a known sender and that it was not altered in transit. DMARC – A DMARC policy allows a sender to indicate that their emails are protected by SPF and/or DKIM, and tells a receiver what to do if neither of these authentication methods pass – such as send to junk or reject the message. PTR record – Ensure that each of your outbound IP addresses resolve to a hostname, or a Fully Qualified Domain Name. MX record – Ensure that each email (sub)domain has a valid MX record that specifies a mail server responsible for accepting email. Visible contact information for the domain and sub-domain is important to show you are not hiding your identity as a sender. A sender can get whitelisted if they are labelled as a safe sender by the subscriber and their ISP. Whitelisting provides an additional opportunity to hit the end user’s inbox. Complaints reduce your reputation score so it is essential that customers who complain are unsubscribed. 3rd party accreditation provides access to an exclusive whitelist that can improve delivery. Senders are required to undergo an extensive vetting process to ensure they are using all the required best practices. Getting the email into the inbox is great, but this is not a once off exercise. You have a few seconds to capture their attention so they don’t delete or complain about your email. In many cases it’s the first thing your customer sees, so it is essential that it is recognizable and trustworthy, otherwise it may be seen as SPAM. Only a few characters stand between email success and the trash bin. Make sure it is relevant and interesting. 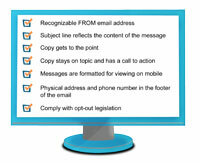 Customers often scan emails rather than read them in full detail due to busy lifestyles. Use headlines, sub-headlines, call-outs and bullet points that break up text for quick scanning. Copy stays on topic and has a call to action. Be clear on what you are asking the customer to do, otherwise they are likely to just file the email or delete it. Mobile rendering can often be very different to the desktop views. With the number of people reading emails on mobile devices increasing it is important to make sure your message is easily readable and actionable. This is to help demonstrate that you are a real live company, with a real physical presence. Many ISP’s and 3rd Party Authentication companies require this for Whitelisting. Non-compliance can lead to rejection during the Whitelisting process and even legal action, not to mention irritating your customers and getting complaints. Testing is essential for an email campaign, no matter how experienced you are. 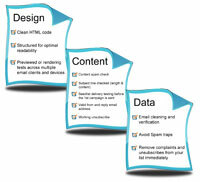 There are several areas that require testing to achieve higher email deliverability. This can’t be missing from your Email deliverability checklist, for Email deliverability testing goes further than just seeing if the email has a good inbox placement. You also want to stimulate good email marketing results. Knowing what your customers will see across all devices and email clients is very important for your emails results. But why include it in your email deliverability checklist? Something as simple as not being able to view a message properly can prompt them to complain about the email. This enables you to fix any issues before you send your messages to customers. Based on eye-tracking we know that most people scan more than they read. . .
HTML syntax and format errors are common tricks spammers use to foil standard content filters, so SPAM filters now also verify that your HTML code is valid. Invalid code is rendered across a wide variety of browsers and the outcome is unpredictable. Customers have come to expect functional and efficient messages as they receive hundreds of communications daily. Email providers check content of emails as another step in fighting the war against SPAM. Sending emails to a test list and checking if they arrived in the inboxes is the perfect pre-send test to see if your email has all the correct elements. Make sure you have a working FROM and REPLY address, as replies to emails count towards engagement which can improve your deliverability. Purchasing lists can lead to unwanted email addresses that are actually spam traps. These will have a detrimental effect on your deliverability. Your ESP should provide you with a comprehensive set of reports so that you are able to monitor your Email deliverability metrics. For instance your Bounce Rate (aim for 3% by removing bounces and keeping your list as clean as possible, etc) & Complaint Rates (under 0.1%). You’ll also need detailed processes defined that indicate what must be done with the information once you receive it. 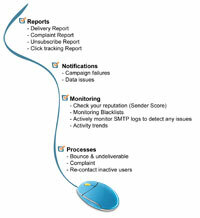 Constant monitoring of key indicators will give you insight into your deliverability status. A definite part of your email deliverability checklist when reviewing different ESPs. An ESP that can offer all these items on the email deliverability checklist is far more likely get your email delivered. When choosing or evaluating your ESP, be sure to keep this email deliverability checklist close by, and you’ll be well on your way to working through the multiple layers of spam defence that ISPs have created around Sender Authentication, reputation checks and content filtering.